I am SO excited today to share with my readers UD’s first official give away!! Spring is in the air! I can smell it and feel it! That mean warm weather is just around the corner which also means the arrival of bugs. 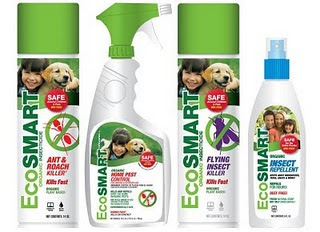 J and I had a conversation the other night about how we are going to need to come up with some more natural alternatives for pest control for the home now that we have Berkley. But before I could do much research the fabulous people over at EcoSmart contacted me offering a free “Safe Home Value Bundle” to share with one of my readers! !